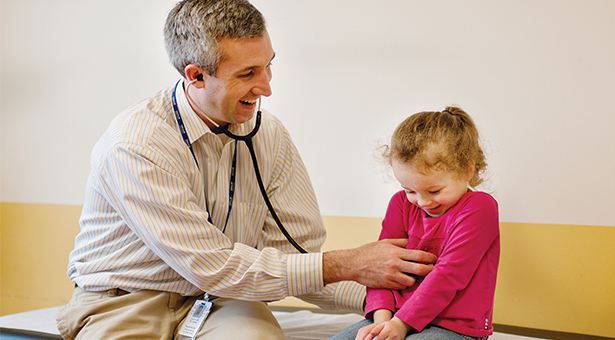 Dr. Christopher Jones listens to the heartbeat of a giggling patient. Jones is a doctor and medical director at HopeCentral, a new nonprofit pediatric health center in Seattle’s Rainier Valley. He and his team have adapted the concept of concierge medicine — defined by a “high level of service with unlimited physician access, longer visits, and added services” — to serve a diverse neighborhood with more than 60 language groups and a 10 percent shorter life expectancy than other parts of Seattle. HopeCentral’s unique business model is subscription-based with sliding-scale pricing, which lets families pay a flat fee each month and avoid unpredictable, high medical bills. “The goal is to offer high-quality care attractive to the entire community,” Jones says. Such care includes behavioral health treatment. HopeCentral employs several child psychologists, including Seattle Pacific University Marriage and Family Therapy graduate student Nora Qin, who sits in on medical appointments and talks with patients and their parents about tactics to address school performance, depression, boundary issues, or anxiety. “For us to be right there on the spot offering resources is invaluable,” she says. But HopeCentral doesn’t stop there. “It’s considered best practice to investigate a patient’s social history, but it’s rarely applied because of time constraints and values,” Jones says. HopeCentral applies that practice by asking about patients’ spiritual health. Max Hunter, adviser to SPU’s pre-professional health students and member of the clinic’s board, is compelled by HopeCentral’s vision to minister to the whole person. He envisions increased opportunities for Seattle Pacific students to partner with the clinic in the future. Student volunteers from Latreia, a ministry of SPU’s John Perkins Center, have already supported HopeCentral in getting off the ground, passing out flyers in nearby neighborhoods. Read an article by Christopher Jones about HopeCentral.